SAN FRANCISCO—September 5, 2007—Apple® today introduced the all new iPod® nano, bringing video playback, an enhanced user interface featuring Cover Flow™, and an incredible new design to the world’s most popular music player. The new iPod nano features a larger two-inch display with 204 pixels per inch, which lets users watch their favorite movies, TV shows and music videos in the same resolution they currently enjoy on the video iPod. iPod nano also includes three fun games, and additional games can be purchased from the online iTunes® Store (www.itunes.com). iPod nano delivers up to 24 hours of audio playback or five hours of video playback on a single charge, and is encased in a beautiful new all-metal design made with anodized aluminum and polished stainless steel and comes in five new colors—silver, black, blue, green and a (PRODUCT) RED special edition. The all new iPod nano features a 204 pixel per inch display that is 65 percent brighter than the previous generation and delivers 320×240 resolution that is perfect for watching your favorite movies and TV shows on the go. iPod nano also features an enhanced user interface that shows off album artwork and photos like never before, and now includes Cover Flow, so you can scroll through your entire music collection by album cover artwork using the Click Wheel. The all new iPod nano is perfect for playing iPod games and comes pre-loaded with iQuiz, the entertainment trivia game; Vortex, a fast-paced 360 degree brick-bashing game; and Klondike, the popular solitaire card game. Additional games will be available for iPod nano later this month from the iTunes Store, including Sudoku and Tetris from Electronic Arts and Ms. PAC-MAN from NAMCO. iPod nano works seamlessly with iTunes so you can import, manage, and then easily auto-sync your favorite content. Buy music, video, and games for your iPod nano from the iTunes Store with more than six million songs available for preview and one-click purchase. With up to 24 hours of audio playback or five hours of video playback on a single charge,* the all new iPod nano is the ultra-portable way to enjoy your favorite music, TV shows and movies on the go. 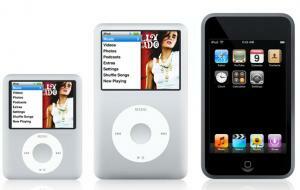 The iPod is the world’s most popular family of digital music players with over 100 million sold. Today, Apple released its most exciting iPod lineup ever with the iPod shuffle in five new colors; iPod classic holding up to 40,000 songs; the incredible all new iPod nano with video playback; and the breakthrough iPod touch with a revolutionary multi-touch user interface. iPod owners can choose from a vast ecosystem of accessories with over 4,000 products made specifically for the iPod including cases, fitness accessories, speaker systems and iPod connectivity in over 70 percent of US automobiles. Available today, the 4GB iPod nano comes in silver for just $149 (US) and the 8GB model is available in silver, black, blue, green and a (PRODUCT) RED special edition for just $199 (US). Both the 4GB and 8GB iPod nano for Windows or Mac are available worldwide immediately through the Apple Store® (www.apple.com), Apple’s retail stores and Apple Authorized Resellers. All iPod nano models include earbud headphones, a USB to 30-pin cable and a Universal Dock Connector. iPod nano requires a Mac® with a USB 2.0 port, Mac OS® X v10.4.8 or later and iTunes 7.4; or a Windows PC with a USB 2.0 port and Windows Vista or Windows XP Home or Professional (Service Pack 2) or later and iTunes 7.4. Internet access is required and a broadband connection is recommended, fees may apply. The iTunes Store is not available in all countries. * Battery life and number of charge cycles vary by use and settings. See www.apple.com/batteries for more information. Music capacity is based on four minutes per song and 128-Kbps AAC encoding; actual capacity varies by content; photo capacity is based on iPod-viewable photos transferred from iTunes; and video capacity is based on H.264 1.5-Mbps video at 640-by-480 resolution combined with 128-Kbps audio; actual capacity varies by content. SAN FRANCISCO—September 5, 2007—Apple® today introduced the new iPod® classic, featuring 80GB or 160GB of storage that holds your entire collection of music, photos, video, podcasts and games—up to 40,000 songs or 200 hours of video. Now in its sixth generation, the new iPod classic delivers all the features customers love about their iPods, plus an enhanced user interface featuring Cover Flow™ and a new all-metal enclosure. iPod classic is priced at just $249 for the 80GB model and $349 for the 160GB model. The new iPod classic holds up to 160GB of storage in an all-metal anodized aluminum and polished stainless steel enclosure. iPod classic works seamlessly with iTunes® so you can import, manage and then easily sync your favorite content. You can buy music, video and games for your iPod classic from the iTunes Store with more than six million songs available for preview and one-click purchase. The new iPod classic features up to 40 hours of music playback and seven hours of video playback in the 160GB model, and up to 30 hours of music playback and five hours of video playback in the 80GB model on a single charge,* letting users enjoy their entire collections of music, audiobooks, audio and video podcasts, music videos, television shows and movies wherever they go. The new iPod classic is perfect for playing iPod games and comes pre-loaded with iQuiz, the entertainment trivia game; Vortex, a fast-paced 360 degree brick-bashing game; and Klondike, the popular solitaire card game. Additional games will be available for purchase for the new iPod classic later this month from the iTunes Store, including Sudoku and Tetris from Electronic Arts and Ms. PAC-MAN from NAMCO. Both iPod classic models are available immediately worldwide in silver and black. The 80GB iPod classic model is $249 (US) and the 160GB iPod classic is $349 (US). iPod classic requires a Mac® with a USB 2.0 port, Mac OS® X v10.4.8 or later and iTunes 7.4; or a Windows PC with a USB 2.0 port and Windows Vista or Windows XP Home or Professional (Service Pack 2) or later and iTunes 7.4. Internet access is required and a broadband connection is recommended, fees may apply. The iTunes Store is not available in all countries. * Battery life and number of charge cycles vary by use and settings. See www.apple.com/batteries for more information. Music capacity is based on four minutes per song and 128-Kbps AAC encoding; photo capacity is based on iPod-viewable photos transferred from iTunes; and video capacity is based on H.264 1.5-Mbps video at 640-by-480 resolution. SAN FRANCISCO—September 5, 2007—Apple® today introduced the new iPod® touch featuring Apple’s revolutionary multi-touch user interface that enables users to find and enjoy all of their music, videos and more on its gorgeous widescreen display with just the touch of a finger. First introduced on iPhone™, the multi-touch interface uses pioneering new software to present the perfect user interface for each application. The iPod touch also includes Wi-Fi wireless networking, the first on any iPod, and three amazing applications that use it—Safari™, the most advanced browser on any mobile device, lets users wirelessly view web pages just as they look on their computer, and features Google Search or Yahoo! oneSearch; Apple’s YouTube application lets users wirelessly watch over 10 million free videos from the Internet’s most popular video website; and the new iTunes® Wi-Fi Music Store lets users wirelessly browse, preview and buy songs and albums from the most popular online music store in the world. The iPod touch is an unbelievable 8 mm thin, and is priced starting at just $299. With its gorgeous 3.5-inch widescreen display, iPod touch is perfect for watching movies and TV shows, as well as viewing photos and album art. iPod touch has a built-in accelerometer that automatically senses when you rotate it into its landscape position. When you’re in music, it automatically switches to Cover Flow™ so you can browse your music collection by album cover artwork with just a flick of a finger. When in Photos, it automatically displays the photo in its landscape aspect ratio; and when in Safari it displays the web page horizontally. iPod touch also has a built-in ambient light sensor that automatically adjusts the display’s brightness. iPod touch features up to 22 hours of audio playback and up to five hours of video playback. The iTunes Wi-Fi Music Store lets you browse the iTunes Top Ten lists of songs and albums overall or by genre, check out new releases and “What’s Hot,” or search for your favorite songs, albums or artists. You can preview any song for free, then purchase and download the ones you like directly onto your iPod touch over Wi-Fi. The music you download will be automatically uploaded into your iTunes library the next time you sync your iPod touch with your computer. With Safari, the most advanced web browser ever on a portable device, you can see web pages the way they were meant to be seen, with the ability to zoom into any webpage with a tap of your finger. The Safari web browser includes built-in Google Search and Yahoo! oneSearch so you can quickly and easily find information you need. iPod touch also includes Apple’s incredible YouTube application that allows you to access, browse and search for millions of free YouTube videos over Wi-Fi. Apple today also announced an exclusive agreement with Starbucks that allows you to access the iTunes Wi-Fi Music Store for free in participating US Starbucks stores starting next month. When you enter a participating Starbucks location, your iPod touch, iPhone, or PC or Mac® running iTunes will automatically recognize the iTunes Wi-Fi Music Store. You can see what song is currently playing or has recently played in the store, and immediately preview, buy and download it over Wi-Fi. The new iPod touch is scheduled to be available later this month. The 8GB iPod touch model is $299 (US) and the 16GB iPod model is $399 (US). iPod touch requires a Mac with a USB 2.0 port, Mac OS® X 10.4.10 or later and iTunes 7.4; or a Windows PC with a USB 2.0 port and Windows Vista or Windows XP Home or Professional (Service Pack 2) or later and iTunes 7.4. Internet access is required and a broadband connection is recommended, fees may apply. The iTunes Store is not available in all countries. SAN FRANCISCO—September 5, 2007—Apple® today unveiled the iTunes® Wi-Fi Music Store, offering music fans the ability to browse, search, preview, purchase and download songs and albums from the iTunes Music Store over a Wi-Fi network directly onto their iPod® touch or iPhone™. With the iTunes Wi-Fi Music Store, music fans can start enjoying their music purchases immediately on their iPod touch or iPhone with no computer required. Once they connect their iPod touch or iPhone back to their PC or Mac®, downloaded music will automatically sync back into their iTunes library. If users have only partially downloaded a song or album onto their iPod touch or iPhone, their computer will complete the download automatically. Prices and selection on the iTunes Wi-Fi Music Store are the same as on the regular iTunes Store. In addition, iTunes customers will now be able to create custom ringtones by selecting up to a 30-second segment from over a million participating songs on iTunes and easily sync them onto their iPhone. Once a customer has purchased a participating song from iTunes, including previously purchased participating songs, it will only cost 99 cents to make up to a 30-second segment of that song into a ringtone and easily sync it onto their iPhone. Customers can personalize their ringtones by choosing which portion of the song they want to use, and setting custom fade in and fade out points. iPhone users can assign a custom ringtone to be their default ringtone and they can also assign them to individual callers in their address book. Customers still have full use of the originally purchased song. Apple today also released the next generation of the world’s most popular music and video jukebox, iTunes 7.4, now available as a free download at www.iTunes.com. iTunes 7.4 includes a larger viewing area for movies and TV, filling the entire iTunes window for a richer, seamless video playback experience that looks better than ever. You can now rate entire albums as well as individual songs. The iTunes Store is the world’s most popular online music, TV and movie store and has become the number three music retailer in the US, surpassing both Amazon and Target. * The iTunes Store features the world’s largest catalog with over six million songs, 550 television shows and over 500 movies and has sold over three billion songs, 100 million TV shows and over two million movies. Both the new iTunes Wi-Fi Music Store and custom iTunes ringtones for iPhone will be available later this month. iTunes 7.4 is available immediately as a free download at www.itunes.com. Music purchased from the iTunes Wi-Fi Music Store is priced the same as music from the iTunes store. Ringtones are available for an additional 99 cents for participating songs that have previously been purchased from iTunes. Internet access is required and a broadband connection is recommended, fees may apply. The iTunes Store is not available in all countries. * Based on data from market research firm the NPD Group’s MusicWatch survey that captures consumer reported past week unit purchases equivalized so that one CD equals 12 tracks, excluding wireless transactions. SAN FRANCISCO—September 5, 2007—Apple® and Starbucks today announced an exclusive partnership that lets customers wirelessly browse, search for, preview, buy and download music from the iTunes® Wi-Fi Music Store at Starbucks onto their iPod® touch, iPhone™ or PC or Mac® running iTunes while at a participating location. When a customer enters a participating location, their device will automatically recognize the iTunes Wi-Fi Music Store using a high-speed Wi-Fi wireless network with no connection fee or hotspot login. Customers will be able to browse, search and freely preview millions of songs, including a new “Now Playing” service which displays the name of the song playing in the Starbucks store at that moment, then easily buy and download songs or albums directly to their device. Prices and selection on the iTunes Wi-Fi Music Store are the same as on the regular iTunes Store. The service will make its debut at more than 600 Starbucks company-operated locations in New York and Seattle on October 2. After its debut in New York and Seattle on October 2, the iTunes Wi-Fi Music Store will continue its national rollout to 350 Starbucks stores in the San Francisco Bay area on November 7; 500 stores in Los Angeles in early February 2008; 300 stores in Chicago in March 2008; and additional markets throughout the US later in 2008. The iTunes Wi-Fi Music Store at Starbucks will run on the robust T-Mobile HotSpot Wi-Fi network which is available at participating Starbucks locations across the US. With Apple’s legendary ease of use, pioneering features such as Cover Flow™, integrated podcasting support, iMix playlist sharing, seamless integration with iPod and iPhone, and the ability to turn previously purchased songs into completed albums at reduced prices, the iTunes Store is the best way for PC and Mac users to legally discover, purchase and download music and video online. Apple ignited the personal computer revolution in the 1970s with the Apple II and reinvented the personal computer in the 1980s with the Macintosh. Today, Apple continues to lead the industry in innovation with its award-winning computers, OS X operating system and iLife and professional applications. Apple is also spearheading the digital media revolution with its iPod portable music and video players and iTunes online store, and has entered the mobile phone market this year with its revolutionary iPhone. Starbucks Coffee Company provides an uplifting experience that enriches people’s lives one moment, one human being, one extraordinary cup of coffee at a time. To share in the experience, visit www.starbucks.com. SAN FRANCISCO—September 5, 2007—Apple® today announced that it is on track to sell its one millionth iPhone™ before the end of September, and to make iPhone affordable for even more customers this holiday season, it is lowering the price of the most popular iPhone model with 8GB of storage from $599 to just $399. The 8GB iPhone is available immediately for $399 in the US through Apple’s retail and online stores and AT&T retail stores. The iPhone 4GB model will be sold while supplies last. This press release contains a forward-looking statement about the Company’s expected iPhone sales that involves risks and uncertainties, and actual results may differ. These risks and uncertainties include those found in the Company’s public reports filed with the SEC, including the Company’s Form 10-K for the fiscal year ended September 30, 2006, and its Forms 10-Q for the quarters ended December 30, 2006, March 31, 2007 and June 30, 2007. The Company assumes no obligation to update any forward-looking statements or information, which speak as of their respective dates.